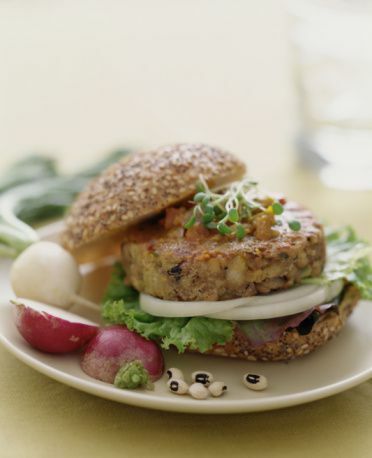 Looking for a healthier, low-fat veggie burger? This recipe uses just a bit of tofu and lots and lots of veggies to form a healthy and high-fiber vegetarian patty. This veggie burger recipe is both vegetarian and vegan. In a blender or food processor, process tofu until creamy and set aside. Sautee the corn, mushrooms, scallions and bell pepper in one tablespoon of oil for 3 to 5 minutes. Add the garlic and cumin and cook for one more minute. Remove from heat and add the carrot, potato, tofu, salt, and pepper. Add bread crumbs until the mixture holds together. You may need a little bit more or less than a half a cup. Shape the mixture into patties and refrigerate for at least one hour. Heat remaining two tablespoons of olive oil and cook each patty until the veggie burgers are done, about 3 minutes on each side. See also: More healthy recipes: Fat-free, gluten-free, low-calorie and more! Don't forget you can always browse through all the vegetarian recipes here or all the vegan recipes here. What Are the Three Best Tasting Veggie Burger Options?